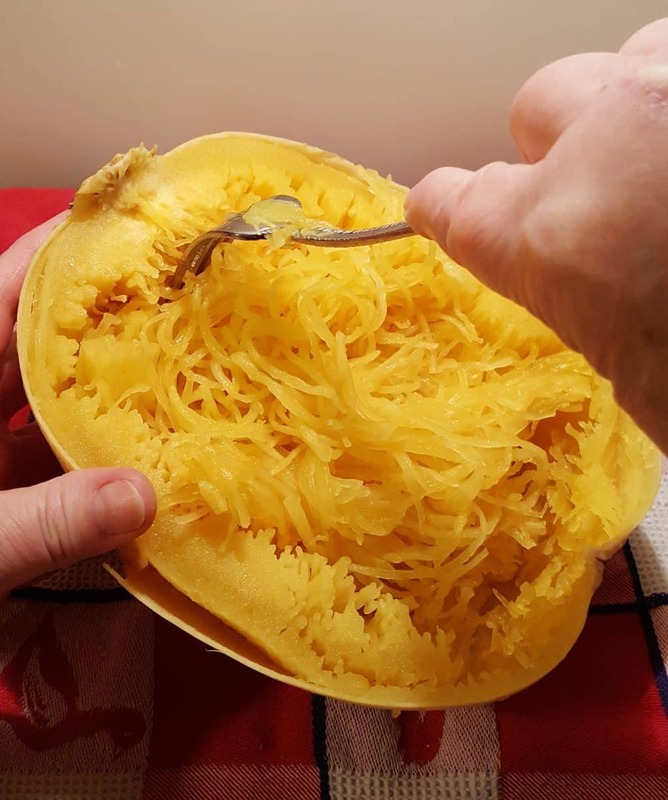 Instant Pot Pressure Cooker Spaghetti Squash is a great way to cut carbs and still enjoy all your favorite noodle dishes. No need to cut it before cooking. You know the saying, “have your cake and eat it too”? Well, Instant Pot Pressure Cooker Spaghetti Squash fits that saying exactly. This versatile Glorious Squash will be ready in less than 30 minutes and is so delicious. Eat it with butter and Parmesan Cheese. Crumble up some Italian Sausage, Tomatoes and Ricotta and you’ve got yourself a delicious meal. My favorite way to eat Spaghetti Squash, is with Sauce, Mushrooms and a dollop of Cottage Cheese or Ricotta. Check out my Pressure Cooker Spaghetti Squash and Meat Sauce for a one pot recipe….. and a story! 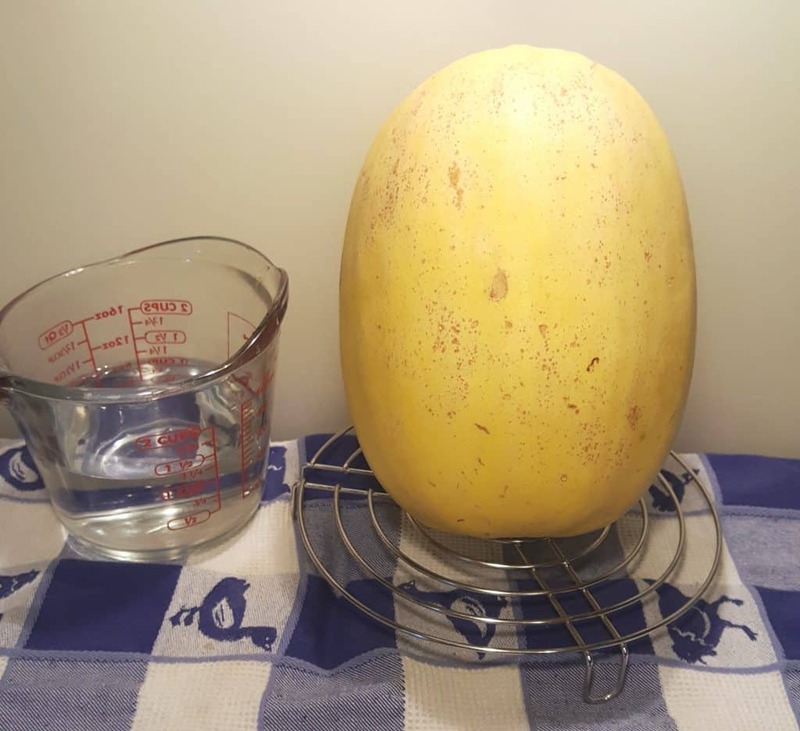 With the knowledge of how to cook Cast of Ingredients for Instant Pot Pressure Cooker Spaghetti Squash, the World is your oyster. Be creative. Anywhere noodles are used, try subbing with Spaghetti Squash. I have loved squash since I was a kid and have had it every way possible, I think. Baking, rather than steaming is how I used to cook Spaghetti Squash, but using a Pressure Cooker takes a fraction of the time. Cooking the Squash whole, will give you more of an oven baked taste. You can cut it open and cook it for a few minutes less, but then you will have a bit of a watery interior. My Pressure Cooker Picadillo Stuffed Delicata Squash and my Pressure Cooker Sugar Pie Pumpkin Puree recipes are both cooked using whole Squash. It’s also much easier to cut the squash after cooking. There is really not much to this recipe. It is more of a method, than a recipe. Add some water to the Pressure Cooker cooking pot, place in a Stainless Steel Trivet and then the Spaghetti Squash. You are all ready to cook. If your Spaghetti Squash is too large for the Trivet, just put it right into the cooking pot. The Trivet, just makes it easier to remove. Accidents from knives in the kitchen, generally happen with a knife is not sharp. 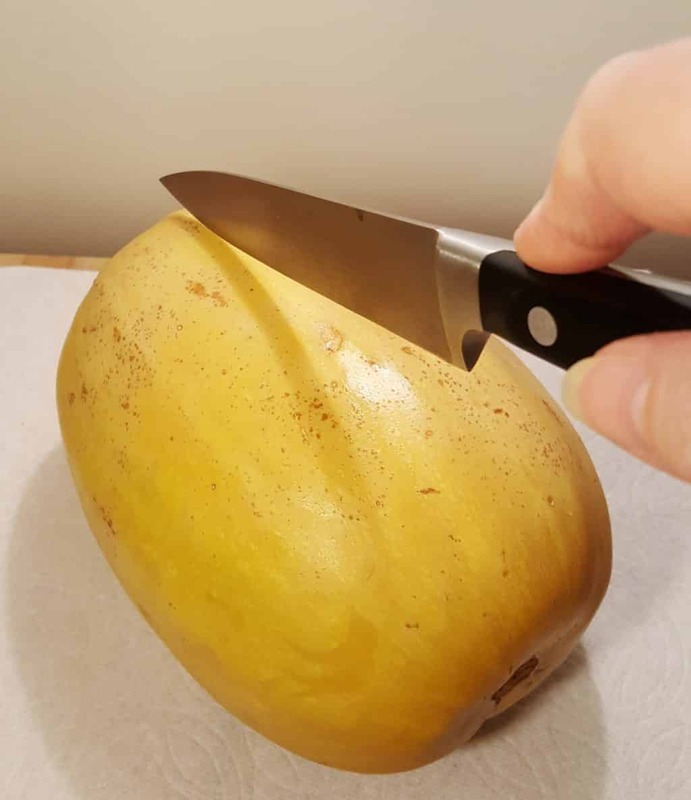 Make sure you use a good knife and carefully slice the Spaghetti Squash lengthwise. Use a spoon or fork and scrape out the Seeds and Guts. 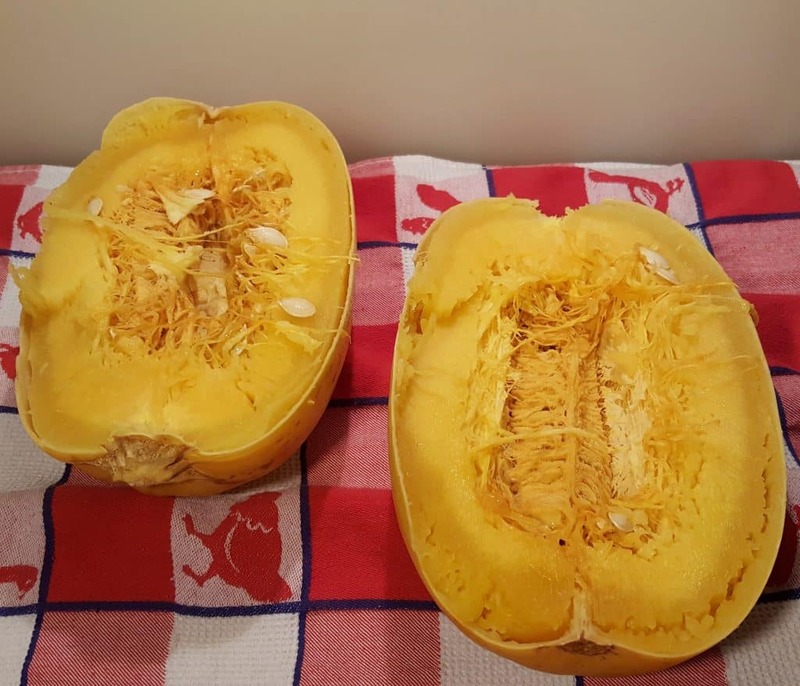 Don’t throw away the Seeds because you can use them to make Toasted Spaghetti Squash Seeds using the same method as Pumpkin Seeds. Since the Seeds are already wet, you can skip the Pressure Cooking part of the recipe. Look at those wonderful strands of Spaghetti. 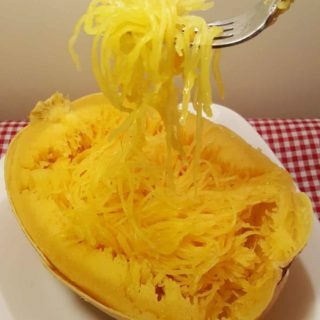 Ah, I mean Spaghetti SQUASH. All the fun of Spaghetti, without the carbs and calories. This vegetable will do a body good! Another delicious recipe for Spaghetti Squash is my Pressure Cooker Spaghetti Squash Chicken Lo Mein! Delicious and ready to eat. Try it with just Salt and Pepper. Butter, Salt and Pepper. Garlic Butter, Salt and Pepper and Parmesan Cheese. This makes a wonderful meal or a main course. For a one pot meal, try my Pressure Cooker Spaghetti Squash and Meat Sauce. Vegetarians, use soy crumbles, or leave out the crumbles/meat altogether. Scrub Squash well and cut end of stem, if necessary. Add one cup water to Pressure Cooker cooking pot and place a Short Legged Trivet. Place Spaghetti Squash on top. Lock on Lid and close Pressure Valve. Cook at High Pressure for 10 minutes. Allow a full Natural Pressure Release. When Squash can be handled, cut lengthwise. Remove the seeds guts. Take a fork and scrape off the strands of Squash. Enjoy. 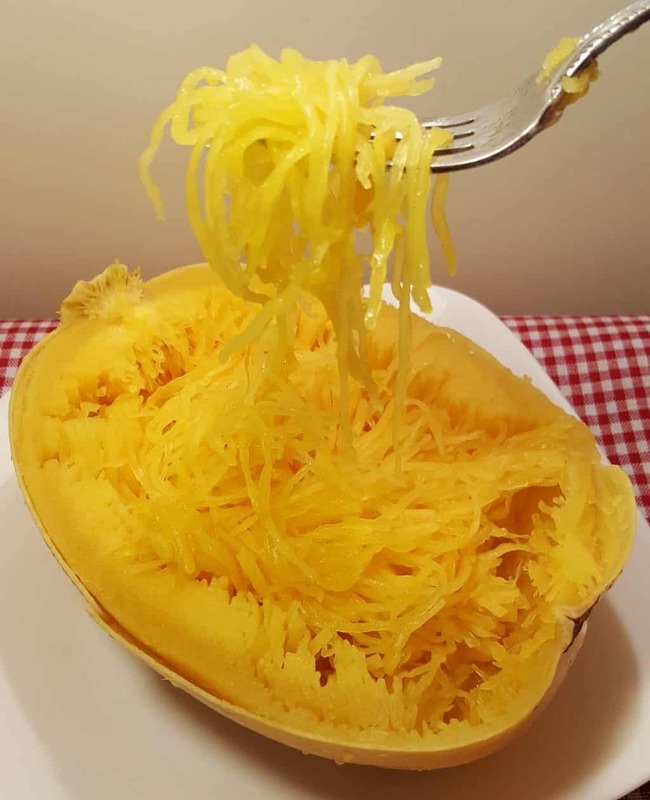 PIN this Instant Pot Pressure Cooker Spaghetti Squash! Can you please tell me if you can freeze the already cooked strands of the spagetti squash ? Do you pierce it before cooking? I do before baking and recently (pre-instant pot) I have been microwavining it to al dente. 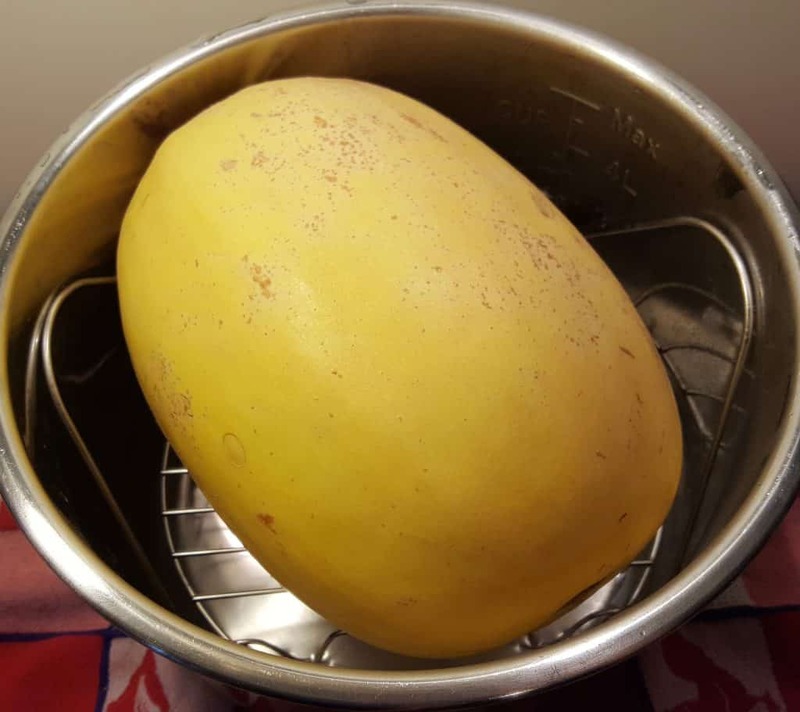 Despite piercing, I have exploded a spaghetti squash in the microwave…twice! I’m a little afraid it will go KABOOM in the IP! I can only find 2-ish lb squash at the store right now. What length of time would be best for a smaller squash? 5 min? This worked wonderfully. Thanks. I don’t think I’ll eat chicken alfredo with regular pasta again. It turned out so delicious! The ONLY way to deal with easily removing squash strands from shell! I made the spaghetti squash in the IP as directed. It wasn’t done. Should I cook for 15 min. next time, or longer?